This collapsible mesh shopping tote can be easily folded up and tucked away in your purse. 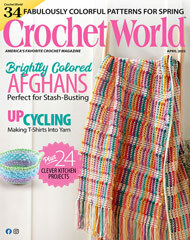 This e-pattern was originally published in the August 2011 issue of Crochet World magazine. Size: Includes small through large. Made with medium (worsted) weight yarn and size H (5mm) hook.